Streams and rivers are driven almost entirely by two alternate energy sources: (1) sunlight that fuels the in-stream growth of aquatic plants (primary production), and (2) plant litter from stream-side (riparian) vegetation. The relationship between these two energy drivers is essentially inverse. The heavier the riparian cover over the stream/river channel, the greater the plant litter inputs and the greater the limitation of light reaching the water and therefore in-stream algae and vascular plant growth. In contrast to nonfilamentous algae, very few stream/ river consumers utilize macrophytes, filamentous algae, and rooted vascular plants. Rather, the macrophytes enter the energy transfer to consumers after they die as detritus. Stream and river systems in which the majority of the energy transfer is from in-stream plant growth to consumers are termed autotrophic. Those systems dominated by the detrital pathways of energy transfer are hetero-trophic. As discussed in the 'river continuum concept' (RCC), the relative importance of these two energy sources changes with stream size. Smaller streams in forested catchments are usually dominated by litter energy sources and wider, mid-sized stream segments are dominated by plant growth in the water. Larger rivers are dependent upon organic matter (OM) delivered from the upstream tributary network. 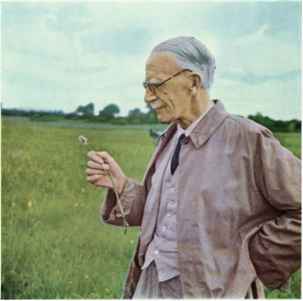 A model of energy flux, that is, the transfer of energy between trophic levels of plants and animals, was produced by Lindeman in the early 1940s and various forms of this model have more or less been the basis for the investigation of energy flux in running waters ever since. These studies most frequently take the form of energy budgets; an accounting of the energy in and the energy out of a given ecosystem (Figure 1) or biological population (Figure 2) or community within the system. OM budgets are useful in identifying the sources, magnitude, and fates of energy and provide insight into internal dynamics of a river system. At the system level, inputs include autotrophic production plus energy originating from the surrounding terrestrial environment (allochtho-nous) that is brought in by various physical vectors. Outputs include community respiration and losses by downstream transport. Energy retained within a stream reach over a given time interval is referred to as storage. 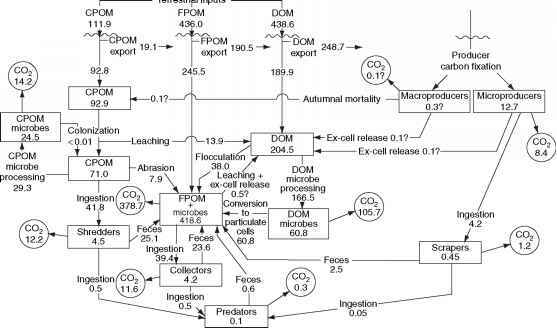 Comparisons of energy flux among and between trophic levels commonly express biomass as caloric equivalents. Animal ingestion, egestion, and growth (increase in mass) are all measured as biomass. Respiration (metabolism) is readily converted to calories consumed using an oxy-calorific equivalent. Tables are available that provide conversions of mass to calories for freshwater organisms. Figure 1 Example of an energy budget for a small woodland stream ecosystem (Augusta Creek watershed, Michigan, USA). All values are in grams ash-free dry massm~2yr~\ Squares represent pools of organic matter in various states; arrows represent transfers and circles represent respiratory consumption of organic matter. From Saunders GW etal. (1980) In: LeCren ED and McConnell RH (eds.) The Functioning of Freshwater Ecosystems. Great Britain: Cambridge University Press. analysis does not lend itself well to simple trophic categorization of stream macroinvertebrates. An alternate classification technique, originally described by Cummins in the early 1970s, involves the functional analysis of stream/river invertebrate feeding. The method is based on the combined morphological and behavioral mechanisms of food acquisition used by the invertebrates and four fundamental categories of their food found in running waters (Figure 3). There is a direct correspondence between the availability of categories of nutritional resources and the relative abundance of invertebrate populations that are adapted to efficiently harvest a given food resource. Five invertebrate functional feeding groups (FFG) have been designated. 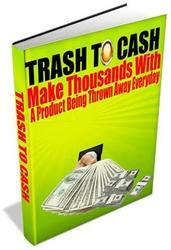 These include shredders, filtering collectors, gathering collectors, scrapers, and predators. These partition four food resource categories in running waters that are defined on the basis of particle size and type: (1) coarse particulate organic matter (CPOM), which is primarily riparian litter that has been conditioned, that is, microbially colonized, within the stream; (2) fine particulate organic matter (FPOM), which are particles generally smaller than 1 mm in diameter that are largely derived from the biological and physical breakdown of CPOM and whose surfaces are colonized by bacteria; (3) periphyton, that is, tightly accreted algae and associated organic material; and (4) prey, that is, invertebrate species or larval/nym-phal stages small enough to be captured and consumed by invertebrate predators. As the relative availability of the basic food resources changes, there is a concomitant change in the corresponding ratios of the FFGs of freshwater invertebrates adapted to specific resource categories. Obligate and facultative members occur within each FFG. These can be different species or different stages in the growth period of the life cycle of a given species. For example, it is likely that most aquatic insects, including predators, are facultative gathering collectors as first-instars newly hatched from the egg. It is with obligate forms that linkages between invertebrates with their food resource categories are most reliable. The distinction between obligate and facultative status is best described by the efficiency with which a given invertebrate converts the resource acquired to growth; that is, obligate forms are more efficient consumers of a given resource, such as conditioned leaf litter, than are facultative forms. For example, shredders feeding on litter consume the fungal-rich leaf matrix, whereas scrapers only abrade the much less nutritious leaf cuticle. The high efficiency of obligate forms feeding on a particular resource category is in contrast with the wider array of food types consumed by facultative forms, but with lower efficiency. The same morpho-behavioral mechanisms can result in the ingestion of a wide range of food items, the intake of which constitutes herbivory (consumption of living plants), detritivory (consumption of dead OM), or carnivory (consumption of live animal prey). Figure 2 Example of an energy budget constructed over 2 years of study for a population of a stream invertebrate (Glossosoma nigrior, Trichoptera) from Augusta Creek, Michigan, USA The budget is based on independent measurements of ingestion, production, and respiration. Modified from Cummins KW (1975) Macroinvertebrates. In: Whitton BA (ed.) River Ecology. Berkeley: University of California Press. Although intake of food types changes from season to season, habitat to habitat, and with growth stage, limitations in food acquisition mechanisms have been shaped over evolutionary time and these are relatively more fixed than the food items ingested. Morphological structures that enable aquatic insects to harvest a given food resource category exhibit significant similarities across diverse taxa. This convergent or parallel evolution lies at the heart of the FFG classification method. For example, larvae of the 26 North American caddisfly (Trichoptera) families are spread among the four major nonpredaceous FFGs. The less highly evolved mayflies (Ephemeroptera) and stoneflies (Plecoptera) are adapted to acquire fewer food resource categories (Table 1). An advantage of the FFG procedure is that it does not require detailed taxonomic separations of the invertebrates. Broad, easily distinguished characteristics allow FFG classification, preferably in the field with live specimens. Separations usually involve systematic distinctions at the level of family or higher, and cut across taxonomic lines. As an example, two groups of case-bearing larval caddisflies (Trichoptera) are sufficient to separate FFG categories at better than 90% efficiency. All families, or genera within families, of Trichoptera that construct mineral cases are scrapers. Those that construct organic cases are shredders. Given the coupling of FFGs and food resource categories, ratios of the different groups can serve as surrogates for ecosystem parameters. For example, the ratio of the functional groups linked to in-stream primary production (scrapers plus those shredders that may harvest live plant tissue) to those groups dependent upon the CPOM and FPOM heterotrophic food resources (shredders of detrital material plus gathering and filtering collectors) provides an index of the ratio of autotrophy to heterotrophy at the lotic ecosystem level. When measured directly, an ecosystem ratio of autotrophy/heterotrophy > 1 indicates an autotrophic system. A surrogate FFG ratio of 0.75 has been measured in such autotrophic stream/river systems.